Click to viewThe new Macbook Pro is not much of a bump up from its predecessors, but it is a step in the right direction. The addition of Multi-Touch is a great new feature, even on a touchpad that's smaller than the one on the Air. However, the Penryn-powered processor in this MBP is running at roughly the same speed as the last generation's chips, GHz to GHz, and give no good reason to upgrade from machines that are less than a year old. The most interesting point here is the boost in efficiency the now-pervasive LED backlighting and 45nm Penryn chips bring to the MacBook Pro, which together give an hour extra battery life over older models with CCFL screens and 65nm CPU technology. That makes this the most efficient Macbook Pro yet. Here's more on the 2.6GHz 4GB 15-inch MacBook we got to play with. After a month of getting used to the Multi-Touch touchpad on the MacBook Air, I have to say that the Pro's touchpad is not quite as good in comparison. Comparatively, the Pro's touchpad is slightly narrower in width and a whole half of an inch shorter in height. (It's identical to the touchpad on the last Gen MBP's pad.) My initial thoughts were that the smaller touchpad would make using Multi-Touch more difficult, but that wasn't exactly the case. Initially, in iPhoto, Multi-Touch on the smaller pad was more difficult, but after a few minutes we realized we were trying to use fingers in the same fashion as we did on the Air, where we had more room to gesture. For example, on the Air we skipped through photos with our fingers vertically but because of the Pro's size it's not comfortable to do this. So we placed our three fingers horizontally and it worked perfectly. We came to the same conclusion with the rotate function. Instead of trying to move our rotate finger from the top of the touchpad to the bottom, we realized that by simply doing the rotate movement with more of a flick, iPhoto and Preview correctly rotated our photo to the next layout. For testing zoom, we did a side-by-side comparison with the Air and found that the Pro's smaller touchpad actually zoomed into the same position as it did using the Air. One thing to note though is that the LED matte screen on the version we got was less bright than the glossy screen on the MacBook Air. 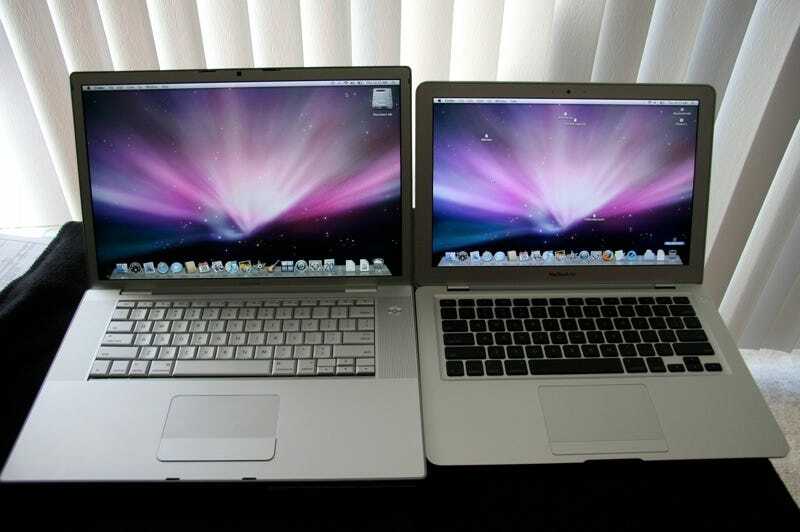 This might be the matte vs. glossy difference, or it might be that the MacBook Air's screen is just brighter. The updated keyboard now has the F-key functions, same as the MacBook Air, and we think the additional Dashboard and Expose buttons use the F-keys nicely. We might not actually use buttons for these features but we think it's cool that the buttons are now clearly labeled. The Penryn MacBook Pro has already been benched and compared to the previous generation MBP, and its clear it's about the same performance, per GHz. With that in mind we tested the new Penryn MBP agaisnt a year old Merom MBP and found a slight increase in speed. Also not surprising. In a video encoding test, the Penryn MBP exported a 2.5min HD trailer in 11 minutes, where as the older Merom MBP took 13 min. (The basic config on the older machine included a 2.33GHz processor and 2GB of RAM; the Penryn had a 2.6GHz processor and 4GB of RAM, so this test is just a rough guide.) As noted in the temperature section, the Penryn did use much more of its power to accomplish the encoding which produced more heat. If you would like to see the Xbench results and compare it to your own machine you can check them out here. While idling, the Penryn MBP's CPU was running at 127 F—slightly cooler than the Merom MBP which had 133 F. But as for the actual experience, the new Penryn MBP felt much cooler on your lap than the older Merom. While performing a video encode in iMovie with the new Penryn MBP CPU was operating at a temperature of 170 F; actually warmer than the older Merom MBP at 165 F. The increase in operating temperature during a video encode is likely because the more efficient machine is still doing more work every second at its higher clock rate. So why do Apple's battery ratings look the same or lower in comparison to the last generation's Macbook Pro ratings? Simple: They made the tests harder. Again, according to numbers provided by Apple, for this and the last generation's MacBook Pro's battery life, you get about half an hour more due to the Penryn redesign, and half an hour more from the LED backlights. As with the AirBook ratings, your mileage will definitely vary. Downwards. But relative to the older books, these are more miserly. Overall this MacBook Pro update is nothing amazing. The Multi-Touch touchpad and the Penryn processor are nice upgrades, but not necessarily something that a previous generation MacBook Pro user would feel an urgency to upgrade to. This update is more about efficiency than power gains.